Sign up - join the Onine Campus Community! The first maps we should draw are those of immediate surroundings experienced as a child. David Soble explains in his book Map Making with Children. There is a great series of books for young people called the First Guide to Maps. There are many open source mapping programs. Many companies supply GIS systems, like ESRI. 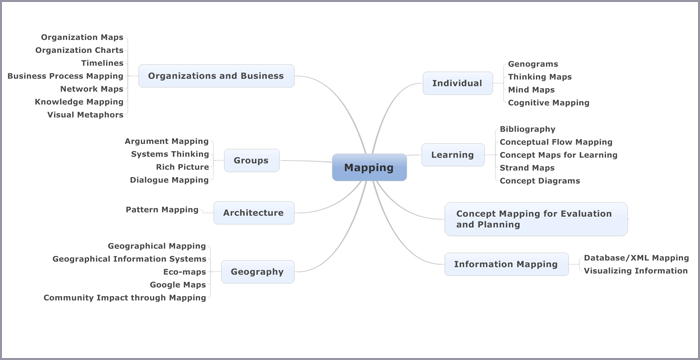 The Coexplorer Project uses a program called CMAPS to support concept mapping. We have our own CMAP server. The software for PCs Macs and Linux can be downloaded for academic use. The program was developed by the Institute for Human and Machine Cognition which is affiliated with several Florida Universities. Conceptual Flows help illustrate a scope and sequence for a curriculum. A definition of conceptual flow includes backward mapping. See for example the Ocean Literacy concept flows. The College of Exploration is a partner with COSEE Coastal Trends. One of the partners is the Integration and Application Network at the University of Maryland Center for Environmental Science. Part of the work of" IAN" is conceptual diagramming and the offering of symbols for anyone to use They produce concept diagrams An example is the land ocean interaction project. The team at COSEE Coastal Trends, the Integration and Application Network and the College of Exploration are beginning to explore what drawing concept diagrams of the ocean literacy framework would be like. Here is a start on Ocean Literacy Principle 7 - The Ocean is largely unexplored. David Hyerle has created an approach to teaching and learning using "Thinking Maps". He describes eight maps types based on cognitive approaches. We use a number of programs for mind mapping and planning. The College of Exploration used Mind Manager to compile a history of actions on ocean literacy prior to actions in October 2004. We continue to use commercial software from Mindjet - Mind Manager for mind maps and project management. FreeMind is a free mind mapping software program. In the late eighties and early nineties we researched the role of cognitive mapping in executive development. We used software called Graphics COPE. This has now evolved into Decision Explorer. A way to map personal and corporate information is with a program called The Brain This is good for visualizing information on computers. "Mapping" of data from different sources can build new applications and reports. The software tool "Mapforce" from Altova is one example. Watch the demo video on Altova Mpforce here http://www.altova.com/videos.asp Altova also offer a program called Stylevision to produce visual presentation of mappings. We like to work collaboratively with partners. We also support collaborative activities by networks and groups. To support that work we use software called Compendium. This program helps display conversations in a more disciplined and diagrammatic fashion. More information is available from the Compendium Institute and also Cognexus. Here is a screencast of a compendium map linked to a GIS system. Peter Checkland has developed Soft Systems Methodology over the past 25 years. Part of the process involves drawing a rich picture. This is a free form graphic (map of the situation) that is highly collaborative and creative, designed to capture the people, processes, organizations and issues involved in the system being studied. Check land's definition of systems thinking is more about human activities systems and their complexity. An organization called NiJeL, creates maps that tell powerful stories and have real community impact. Across the globe, NiJeL uses high performance mapping to identify and mitigate social, economic, and environmental problems in poor communities now so they don't become humanitarian disasters later. Stafford Beer has mapped organizational systems. His Viable System Model is a map for understanding and designing organizations. The College of Exploration org chart is created using Microsoft Visio. See the org chart. Edward Tufte has written seven books on the presentation of data and information in a visual form. He has a website. We have helped organize and contributed to in a number of online workshops on Knowledge management and mapping, one was called the Knowledge Ecology Fair. Another for IBM was called KMBlue98. The maps are made of family relationships based upon the family tree and the genealogical position of an identified person. Wikipedia describes genograms as a pictorial display of a person's family relationships and medical history. Software such as Genopro can help to create these maps. Eco-map "is a graphical representation that shows all of the systems at play in an individual's life" according to the entry in Wikipedia They have some similarity to genograms but are more descriptive of the wider contexts. The term was apparently coined by Hartman in 1975 in relation to assessing family relationships. A broader definition could include complex pictures of ecosystems. This could also include pictures related to ecosystem management. We use Timeline Maker - a timeline program to map our history and key events. David Sibbet was one of the founders of Grove Consultants . They are developing Visual Planning Systems. Exploration is about creating and using maps. Whether maps of space, earth, the ocean, to constructed spaces and the human mind The College of Exploration has an going program of action research on the creation and use of maps. We use a selection of different mapping approaches and software programs to assist with the mapping process.